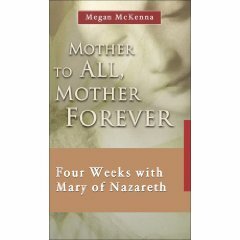 Description: Pope John Paul II referred to Mary as the Mother to All and Mother Forever. The faithful know they can count on the heavenly Mother’s concern and that Mary will never abandon them. By taking her into our own home as a supreme gift from the heart of the crucified Christ, we are assured a uniquely effective presence in the task of showing the world in every circumstance the fruitfulness of love and the authentic meaning of life. May the meditations offered here accompany you over the next four weeks and beyond and may the woman who so loved the Word lead you to do whatever He tells you (Jn 25). And may you live on the Word of the Lord so that it takes on the flesh of your own life. A well known workshop facilitator, retreat leader and author of over 30 books, Megan McKenna received her doctorate from the Graduate Theological Union, Berkeley, CA. She has taught at many different schools, including Fordham University, the Washington Theological Union, and the East Asian Pastoral Institute in Manila. She also serves as an Ambassador of Peace for Pax Christi USA.